Dayton Dental is dedicated to helping you keep your smile in optimal health for a lifetime. Dr. Matthew Flugstad knows that every individual’s oral health journey will be different and that some smiles may need a little extra TLC. Your physical and emotional health can suffer if you’re dealing with tooth decay or missing one or more teeth. Dayton Dental would like to restore the health and happiness of your smile, and we’re able to do so with restorative dentistry using modern materials and technology. A crown is a type of dental restoration that completely covers a tooth or dental implant. Crowns become necessary when the size of a cavity has threatened the ongoing health of a tooth. The process of placing a crown typically requires two appointments, though there are times a third visit is needed to ensure the most precise fit. The first part of the procedure will be removing the decay from the tooth or teeth that are affected. After the decay is removed, we will take impressions of the tooth or teeth and send them to the lab where your restorations will be created. While the crafting happens, you’ll be fitted with a temporary restoration that will resemble your natural teeth. The second part of the process will be placing the final restoration. We will make every effort to ensure the new tooth feels exactly like the rest of your natural teeth after it’s fitted comfortably into your mouth. After we cement the crown, you’ll have a beautifully restored smile. 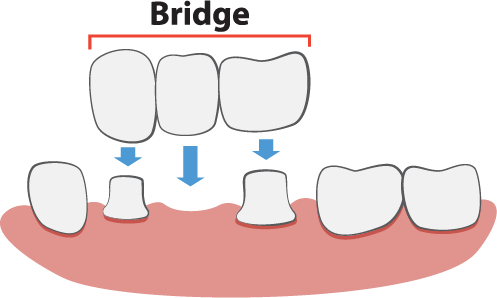 Bridges are another option for teeth replacement. Also known as a fixed partial denture, the preparation is similar to that of crowns. The key differences are that adjacent teeth will need to be prepared for a bridge, and the neighboring teeth will be used as an anchor for this restoration. You’ll have a temporary bridge while we wait for your customized permanent to be crafted, and our material options match those used for crowns. You can count on Dr. Flugstad to go over your options thoroughly and find the best fit for your smile and lifestyle. For added security and preservation of surrounding teeth, bridges can also be anchored with dental implants for the most secure, life-like solution to missing teeth. The materials used to craft your crown or bridge will vary based on the location of the tooth or teeth being restored. For rear teeth, porcelain fused to metal will be recommended because of the increased biting forces that back teeth endure. The metal core of this tooth colored crown makes it stronger than an all-ceramic crown. Though metal cores can be made of many different materials, our office uses only “high noble”, which means almost all gold (over 96% or 23 karats, with an additional 2.6% platinum). We select high noble metal because of the better fit, extremely rare allergies and sensitivities, and for the aesthetics. High-quality, tooth-colored porcelain will be baked on the outside of the gold. Because of the metal under the porcelain, your crowned tooth won’t have the same translucency as your natural teeth, but since it’s in the back, no one will know the difference. Crowns that are all-ceramic (or porcelain with ceramic substrate) are used for the most visible teeth in our mouths because of their natural beauty and translucency that mimics natural teeth. Full gold crowns may be used at a patient’s request, but are recommended for teeth with low visibility. The primary benefit of a full gold crown is durability. Other types of crowns include stainless steel (for baby teeth that will fall out), noble metal, and base metal. Base metal crowns aren’t as popular because of their weaker bond to porcelain, their less comfortable fit, and the documented sensitivities and allergies. 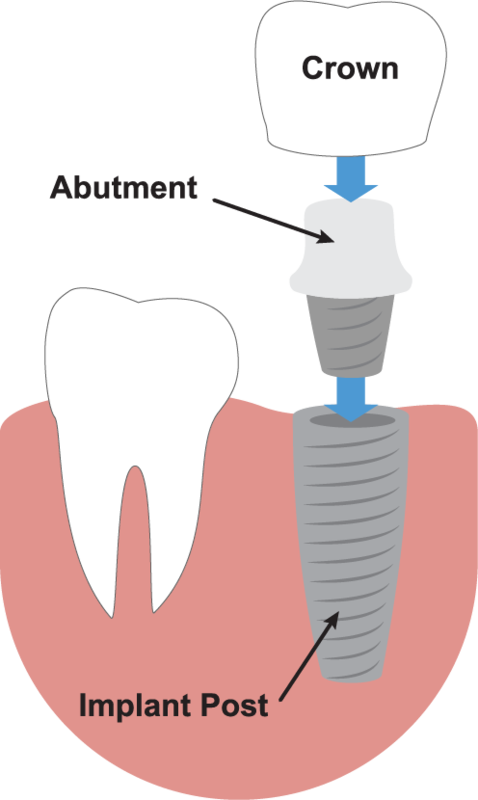 Dental implants are small titanium posts placed into the jawbone to replace a tooth’s root and support a crown, bridge, or full denture. If you’re missing a tooth or multiple teeth, Dr. Flugstad can refer you to a trusted implant dentist in Edmonds to have your implant(s) surgically placed. Once healed, or if you already have an implant that could use a new restoration, Dr. Flugstad can create a beautiful new crown or bridge for the most secure, life-like solution to missing teeth. If you have questions about restorative dentistry or would like to schedule a consultation, please don’t hesitate to give Dayton Dental a call today!